Drafts provides lots of built-in actions as well as the ability to create your own actions. Drafts for iPhone and iPad by Agile Tortoise is one of those apps that's difficult to describe in one sentence. On one hand, you can lump it in with the growing number of iOS text editor apps. But, while all those other apps are designed to work with longer text-only documents, Drafts' primary focus is short notes. But don't let that fool you because Drafts really isn't a note-taking app either. Confused? Maybe this will help. Think of Drafts as a tool that helps you automate text-oriented actions and integrate other iOS apps. If that still doesn't make sense, then perhaps the best way to describe Drafts is to provide an example of how I use it. Drafts can communicate with other apps via "URL actions" using an easy-to-use scripting language. As a Web developer and project manager, I keep lots of notes, which I store as plain text files in my Dropbox account. 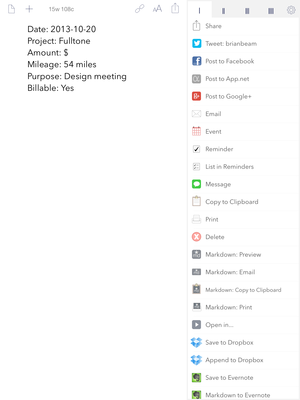 One of the notes that I update frequently contains a running list of my business expenses. When I want to record an expense while at my Mac, I'll open my expenses file in nvALT, place my cursor at the top of the document, then use a TextExpander script that prompts me for input and inserts that info into my file. However, what if I need to record an expense while I'm not at my Mac? While I could always edit the file with a Dropbox-powered text editor on my iPhone or iPad, Drafts makes this process fast and easy on an iOS device—even easier than on the Mac. When I open Drafts, it greets me with a blank screen where I can immediately start typing. 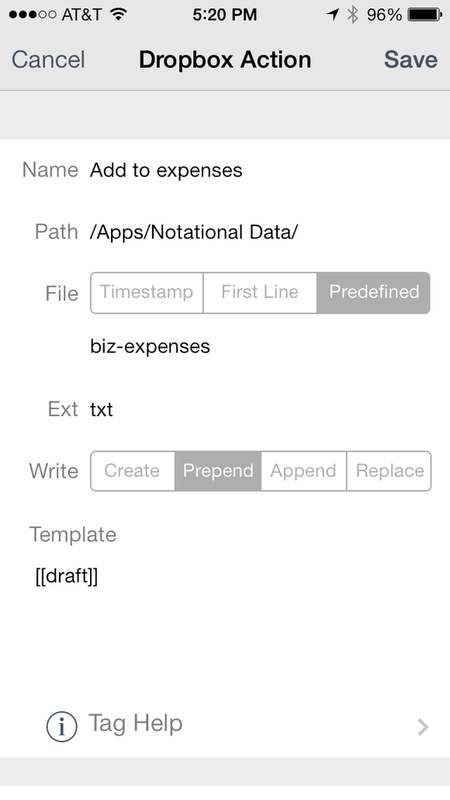 So, I call up my TextExpander snippet and enter my expense info, which ends up as a few lines of text in Drafts. Next, I select an "action" I created called "Add to Expenses" which prepends the text in Drafts to the top of my expenses file that's stored in Dropbox, all without needing to open the file and edit it directly. Actions in Drafts are little scripts that can manipulate the text in a note and send it on to other apps for additional processing. The app provides several that you can use straight out of the box. 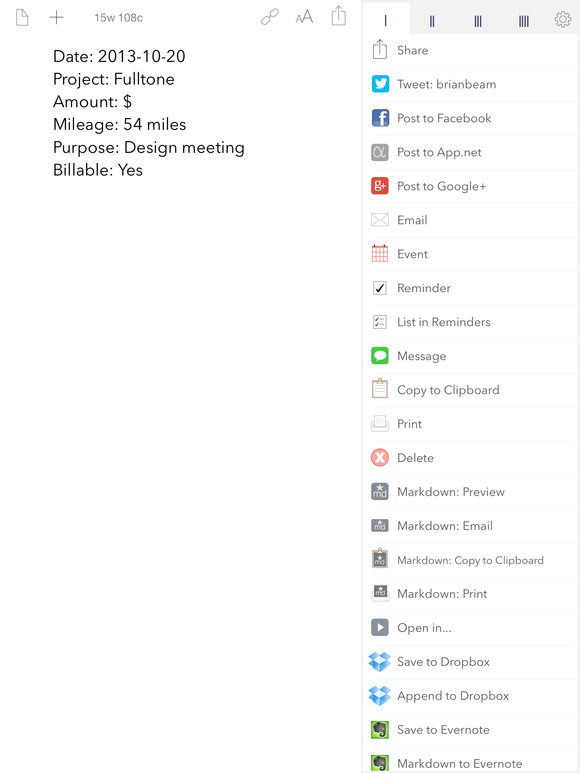 For example, you can post to Twitter, Facebook, Google+ and App.net, create Reminders, save to Evernote, create tasks in Clear, and so on. While these built-in actions are handy, Drafts' real power lies in your ability to create your own actions. You can use the built-in actions as examples, but it doesn't stop there. 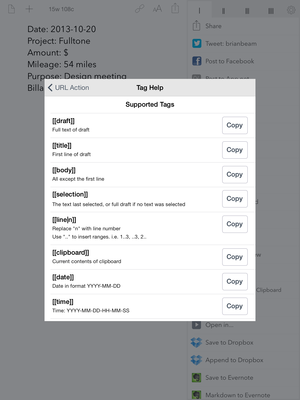 Drafts can talk with almost any other app on your device, as long as it provides a URL scheme to enable that communication pathway. 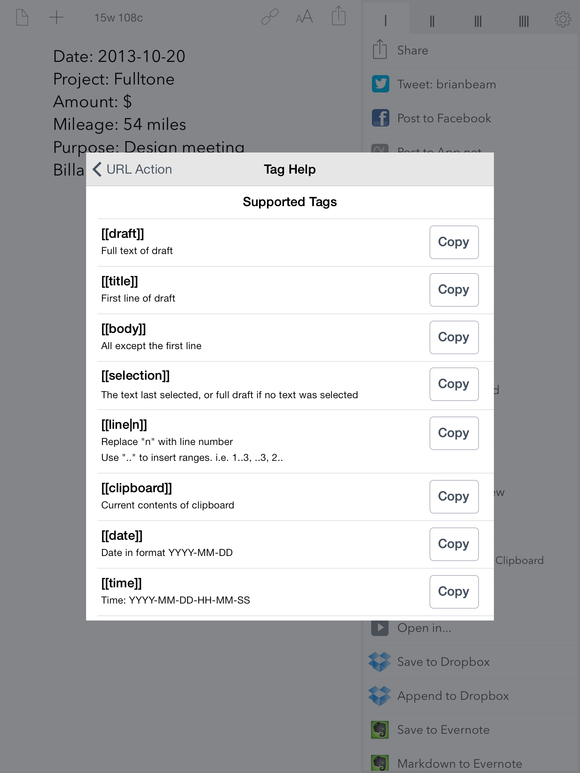 Drafts' Dropbox Action lets you send changes to Dropbox-hosted documents behind the scenes. While some of you may be thinking that Drafts sounds like a tool geared only towards geeks, you're only partially correct. While creating actions with custom URL schemes might be beyond average users, those who post to social media services, for example, may find the built-in actions useful to collect interesting posts in Drafts throughout the day, then post them via the app later. Writers who work in Markdown would likely appreciate the ability to compose text in Drafts using Markdown syntax, then send the formatted text to Evernote or to Mail. In fact, you can even skip all the fancy stuff and just use Drafts to jot down notes and reminders to yourself to review later. Drafts automatically saves all your notes for you. Those that you want to keep around can be "pinned" so that you can call them up quickly. You can use Drafts' search feature to locate notes of interest and you can archive (or delete) ones you no longer need. If you choose, you can sync your notes and actions to the cloud so that you can use them on all your devices. Rather than using iCloud, Drafts syncs via Simperium, which the developers feel is currently more reliable than iCloud. If you don't already have a free Simperium account, you can easily create one within Drafts. Drafts is a very powerful and flexible tool that mainly provides the means to an end, not the end product itself. It's one of a growing number of apps that are helping to break through the rigid confines of the iOS application sandbox and getting apps to work together in ways that were once thought impossible. Drafts is currently available for the iPhone/iPod touch ($3) and the iPad ($4) but is not a universal app. Although the iPhone version works satisfactorily on the iPad, you'll likely want to purchase both versions if you own both types of devices.